The bad news? You've got a major pimple developing on your face and exactly one day to get rid of it. The good news? Wei To Go Clear Complexion Calming Mud Spot Treatment is on the case. I must admit, I was a little skeptical that this product could actually rid me of my blemishes and impurities in only one night. But you know what? It really and truly works. Thanks to a combination of mung bean, peach, pomegranate, honeysuckle, mulberry and sesame, your pores are de-clogged, the extra oil is absorbed and your skin is soothed. Plus, the packaging is just so fun. You unlatch the little disc on the front and squeeze out a little bit of mud -- and, really, a little goes a long way. Then you just dab onto your skin, wait until it dries (about 10-15 minutes) and voila! The redness goes down considerably almost immediately, and by morning? Consider that pimple gone for good. 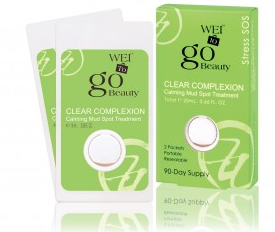 Wei To Go Clear Complexion Calming Mud Spot Treatment retails for $19 at weieast.com. This stuff would be awesome! I'll have to get it sometime.